CLICK for more Tengu Masks !
. . . CLICK here for more Karasu Tengu Masks ! 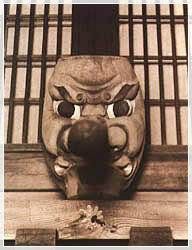 Many temples have Tengu masks and many festivals use them. Priest Tenson Keijun 天巽慶順 and his Tengu disciple (Nakamine) Chuuhoo Sonja 中峰尊者 Chuho Sonja Sonja. 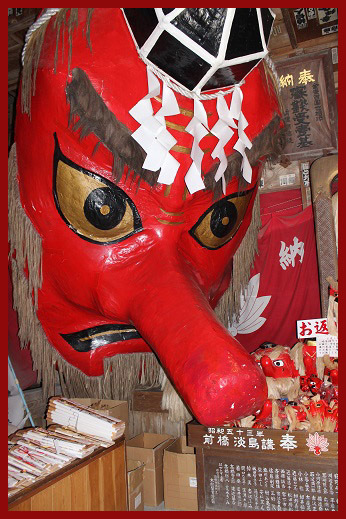 This mask of a Tengu at Kashozan is maybe the largest, 5.5 m long and a nose of 2.7 meters. 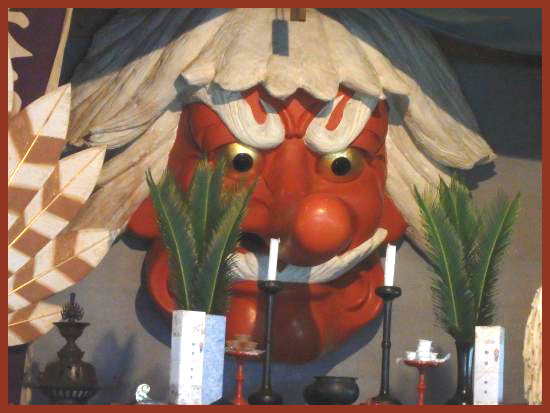 Tengu mask in the 天狗堂 Tengu Hall. This mask is 2.4 m long and 2.7 m wide. 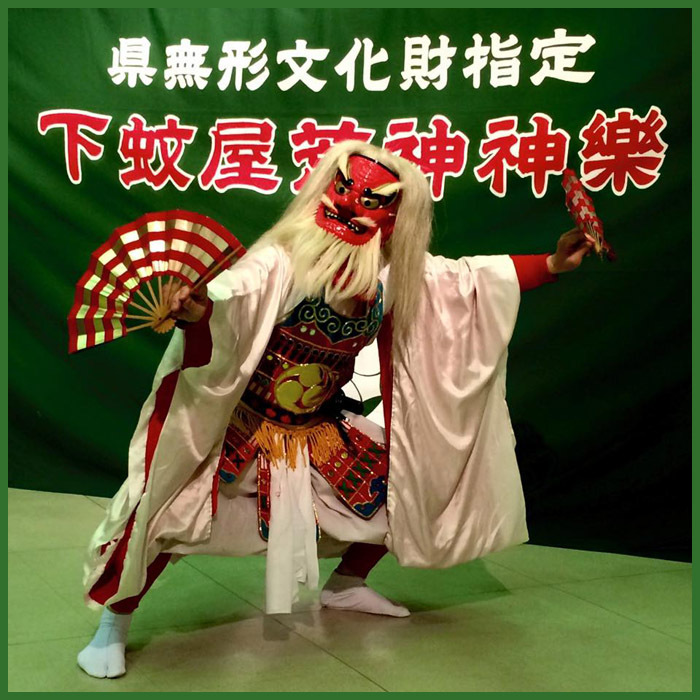 On January there is a special Tengu Festival in its honor. At the mountain village 瀬村 Semura there is a festival where the local people make a large mask of a Tengu and send it off to the next village in the deep mountains with music of drums and bells. The Tengu is seen as a protector of the humans and their animals. This custom lasted until the early Meiji period.
. Tengu mask from 妙義山 Myogisan . a Tengu is the protector deity of the shop. Tengu was a "friend" of the founder on his visits to the local Izakaya bar and also familiar to the shop founder from Kurama in Kyoto. The founder 中田岩次 Nakada Iwatsugi carved a mask, put on some flashing robes and rode through the town on a horse to draw attention to his shop. At that time, eating meat was not yet very popular in Japan. The shop was first named 天狗乃肉 Tengu no Niku, The Meat of Tengu. 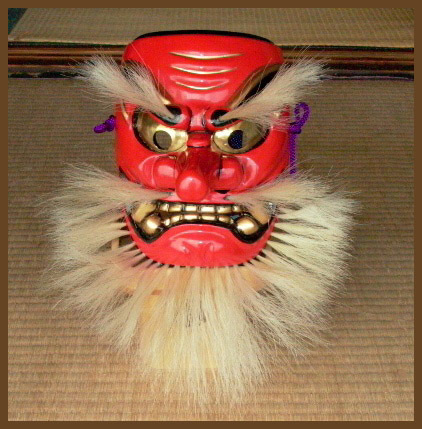 On the 3rd of Nbvember, the founding day of the shop, the mask of Tengu is venerated. 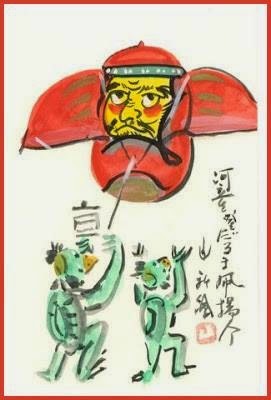 During the New Year celebrations, a scroll of Tengu is hung up. At the annual festival, children are choosen to be the アマメハギ Amamehagi. They wear masks of a Tengu or for a 獅子頭 lion dance and walk around the village from home to home, where they receive sweets. At night they have to stay awake in the local shrine. 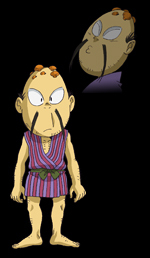 is a little male Yokai monster. 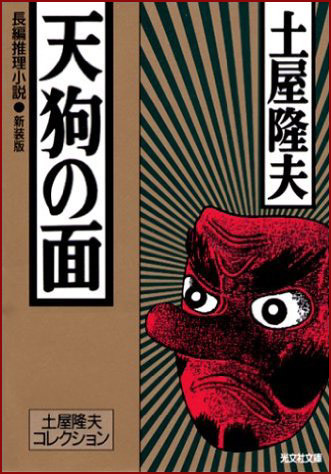 He has mushrooms on his head which he uses to attack things.
. Namahage なまはげ - Introduction .
. Tengu misaki 天狗ミサキ . 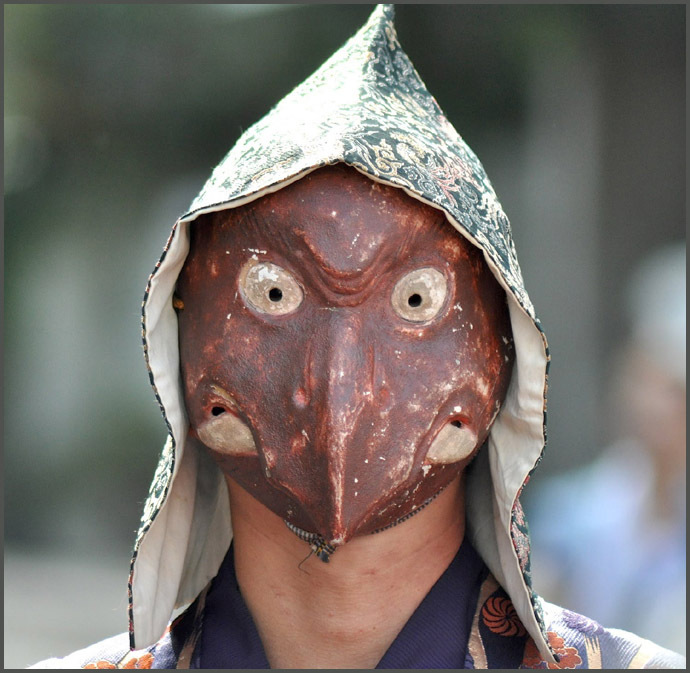 During the Shrine Festival, a man clad in a Tengu mask is lead by a man with a mask of the God Sarutahiko 猿田彦. The onlookers must take care not to look down on the two of them.
. Komine Jinja 古峯ヶ原古峯神社 (Furumine Jinja). .
Tengu no yado 天狗の宿 "The Inn of the Tengu"
. men, omote 天狗面 Tengu masks　- many more photos . CLICK for more Kagura Tengu !